This power pack sure looks portable! Exactly. Why tow a large compressor to the site if you donn++t need to? The CP hydraulic power pack couldnn++t be more convenient. For site-to-site transportation, two people can lift it into a truck. On-site, the CP power pack can easily be wheeled around by one person. 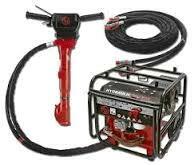 CP hydraulic power packs are available in gasoline, diesel or electrically driven versions, and provide portable power for a long list of applications in the 5-10 gpm/2000-2500 psi range. How are they to operate? Couldnn++t be simpler. The thermostatically controlled oil cooler gives fast warm-up and helps prevent the hydraulic oil from overheating. Correct working temperature is achieved within minutes n++ even during the winter. The variable flow on/off valve enables simple tool change and slow start up. A gauge shows when itn++s time to change the filter. What about fuel consumption? Many of the power packs are equipped with Power On Demand. This system automatically idles the engine when the tool is not being used and speeds it up when the tool is activated. It saves fuel and keeps noise to a minimum. * Please call us with any questions about our hammer jack hydraulic pack kit rentals in Duluth MN and Superior WI, serving Proctor MN, Hermantown MN, Northern Minnesota and Northern Wisconsin.